Appearance: The Yaqui Catfish is very similar in appearance to the Channel Catfish (Ictalurus punctatus). Coloration is dark gray to black dorsally while the underside of the fish is white to grayish. The barbels along the lower mouth are jet-black except on chin, where they are gray to white. Yaqui Catfish are smaller than Channel Catfish with adults reaching lengths of up to 24 inches. Diet: Unknown, it is thought to be much like Channel Catfish in that they are an opportunistic omnivore, with a diet consisting of aquatic vegetation, insects, worms, and small bodied fish, all of which could be dead or alive. 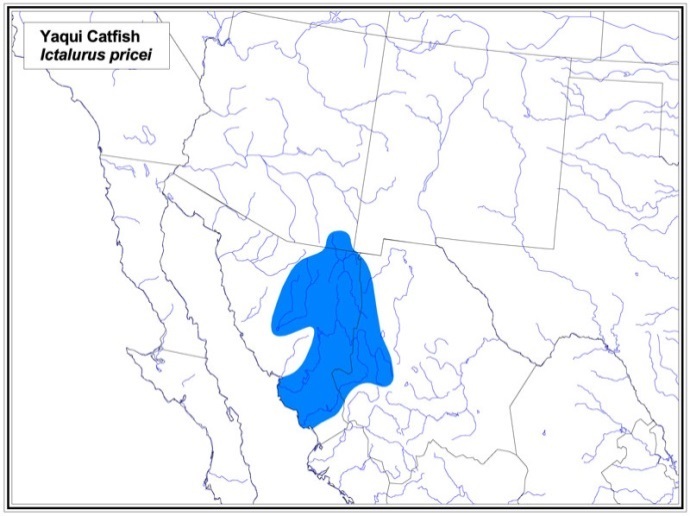 Habitat and Range: The Yaqui Catfish is the only catfish native to the Pacific slope of North America, with most of its historical range in Mexico and possibly the uppermost Rio Yaqui River system in Arizona. A population of Yaqui Catfish stocked into the upper Santa Cruz River, AZ in 1899 (Chamberlain 1904) and persisted until the late 1950’s (Miller & Lowe 1964, 1967). Other than from the Santa Cruz stocking, no records supported by specimens are known from the United States (Minckley 1973, 1985) and it is uncertain if the species was historically native to Arizona. 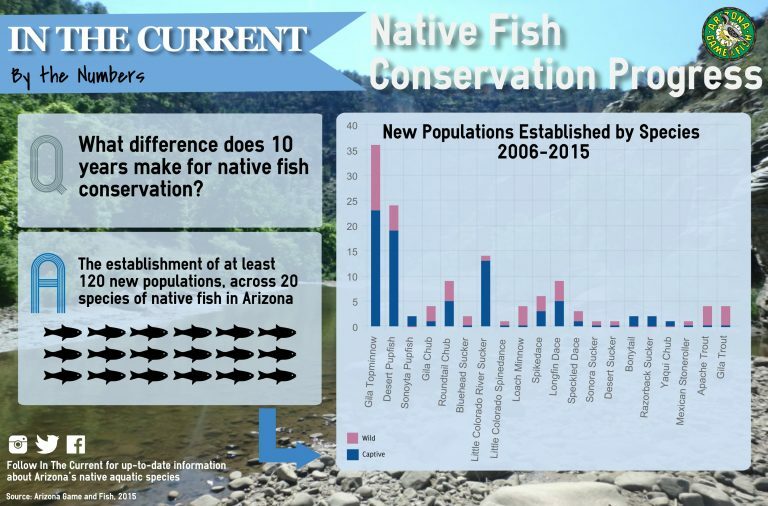 Today the only populations within Arizona are found in 3 locations consisting of fish stocked in the 1990’s in the extreme southeastern corner of Cochise County. In Mexico recent range-wide surveys indicate that the Yaqui catfish is now restricted to the Yaqui, Mayo and Fuerte river basins. Yaqui Catfish occupies ponds or streams, primarily in larger rivers, but also in small stream reaches where it prefers quiet, clear pools. They are most common in larger rivers in areas of medium to slow currents over sand/rock bottoms. Breeding: The breeding habits of this species are currently a mystery. There has been no reproduction documented in the small populations in Arizona since they were established in the 1990’s. It was believed for years that they spawned in cavities like Channel Catfish; however, efforts to provide such habitat in locations where populations occur have been unsuccessful. Efforts involving the use of hormone therapy in captive populations have proven to be difficult with only one successful event documented in the early 1990’s. Status: Federally Listed as Threatened with Critical Habitat in 1984. Threats: Habitat destruction, dewatering and hybridization with Channel Catfish. Actions: Currently within Arizona, management of Yaqui Catfish is focused on increasing the overall population size through increased spawning success; due to the poor understanding of this fish’s reproductive habit these efforts have been mostly unsuccessful. Research into the spawning habits of this fish would greatly benefit the species. In Mexico, efforts are focused on reducing the impacts from groundwater pumping, habitat destruction, and impacts from nonnative species competition. Miller, R.R. & C. H. Lowe. 1964. Annotated checklist of the fishes of Arizona. Pp. 133-15 1, in The Vertebrates of Arizona, Ed., C. H. Lowe. Univ. AZ Press, Tucson. Minckley, W.L. 1973. Fishes of Arizona. AZGFD, Phoenix. Minckley, W.L. 1985. Native fishes and natural aquatic habitats of US Fish and Wildlife Service Region II, west of the Continental Divide. Final Rept., USFWS-AZSU Interagency Pers. Act Agr., AZSU, Tempe. Map of Yaqui Catfish range in Arizona and Mexico.